The Fathers of the Church explained that the incident shows us the correctness of resisting wayward ecclesiastics, even popes. “Superiors may be admonished by their subordinates in all humility and charity so that truth may be defended: this is the basis (Galatians 2, 11) on which St. Augustine, St. Cyprian, St. Gregory, St. Thomas and many others who are quoted support this opinion. 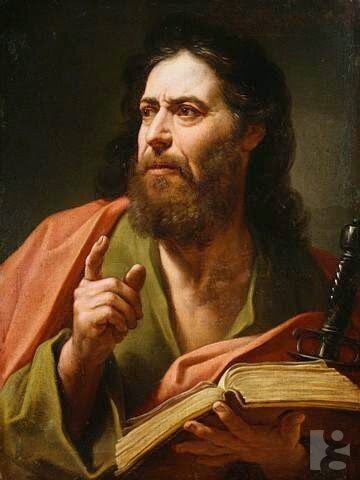 They teach quite unequivocally that St. Peter, although superior in authority to St. Paul, was admonished by him. St. Gregory rightly states that, “Peter remained silent so that, being first in the hierarchy of the Apostles, he might equally be first in humility.” St. Augustine writes, “By showing that superiors admit that they may be rebuked by their subordinates, St. Peter gave posterity an example of saintliness more noteworthy than that given by St. Paul, although the latter showed, nonetheless, that it is possible for subordinates to have the boldness to resist their superiors without fear, when in all charity they speak out in the defence of truth.” (Commentary Ad Gal., II, 11.) So, the Doctor St. Augustine told us that we should “boldly” resist superiors, including the Pope, “without fear”, when we are defending the Faith. NOTE: That is how a heretical pope and his errors are to be resisted: “boldly”, “without fear”, “publicly” and “before everyone”, because he is a “danger to everyone”. That is the teaching of the Fathers and Doctors of the Church. Pope Adrian VI († 1523) stated that “it is beyond question” that a pope can “err in matters touching the Faith”, he can “teach heresy” in decrees. He also stated “many Roman Pontiffs were heretics”. “We read that the Roman Pontiff has always possessed authority to pass judgment on the heads of all the Churches (i.e., the patriarchs and bishops), but nowhere do we read that he has been the subject of judgment by others. It is true that Honorius was posthumously anathematized by the Eastern churches, but it must be borne in mind that he had been accused of heresy, the only offense which renders lawful the resistance of subordinates to their superiors, and their rejection of the latter's pernicious teachings”. However, I must disagree with Pope Adrian when he said that heresy was the only offense that justified resistance: the Saints and Doctors have informed us otherwise, as we shall see. Further, Pope Honorius I († 638) was not merely “accused of heresy” or “anathematized by the Eastern Churches”: he was anathematized as a heretic by the ecumenical Council of III Constantinople, whose Acts were confirmed by Pope Leo II († 683). The first Doctor of the Church, St. Athanasius († 373), told us that “Catholics faithful to Tradition” can be “reduced to a handful”. 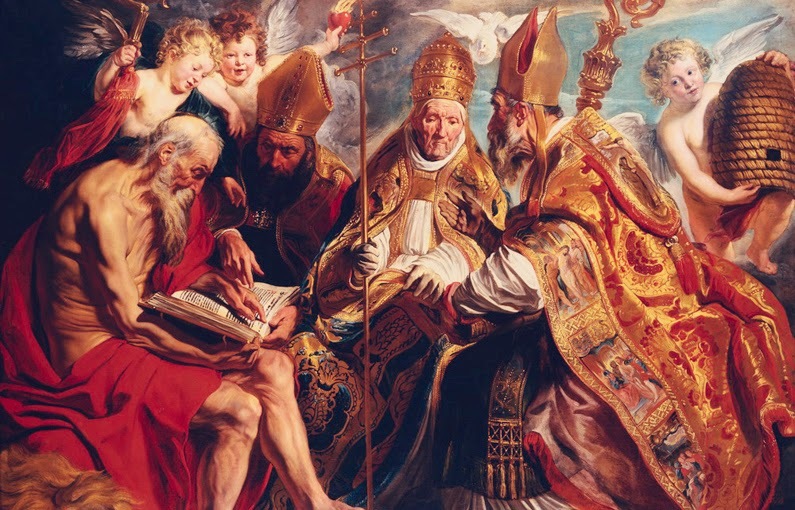 He wrote during the Arian crisis, when the global episcopacy defected to Arianism and Pope Liberius († 366) went into heresy, signed a heretical Arian creed and invalidly excommunicated St. Athanasius, as did the heretical bishops of the East. St. Vincent of Lerins († 445) is the Father of the Church most associated with the defense of unchanging doctrinal tradition. It is the subject of his main treatise, the Commonitory. He foresaw that if the whole Church should go into heresy we must keep to the traditional Faith handed down from the Fathers. NOTE: A general corruption of the hierarchy has been foreseen and has happened before and the Saints have told us how we are to respond: we are to keep to the traditional, true Catholic Faith which has been handed down from the Fathers and to reject the “lying novelties” of the pope and the hierarchy. “He would certainly be in sin, and it would be unlawful to allow him to act in such a fashion, and likewise to obey him in matters which are evil; on the contrary, there is a duty to oppose him while administering a courteous rebuke". NOTE: "It would be unlawful to allow him to act in such a fashion, without any resistance, and likewise to obey him. There is a duty to prevent him, and likewise an obligation to oppose him and resist him. As he has papal power only to build up the Church and not to destroy it, it is lawful to oppose him. He is to be resisted and the fulfillment of his commands prevented. Open resistance is a right and a duty". The theologian Tommaso Cardinal de Vio Gaetani Cajetan O.P. († 1534) declared: “It is imperative to resist a pope who is openly destroying the Church.” (De Comparata Auctoritate Papae et Concilio). Such a pope must be resisted, his policies opposed and prevented and true Catholic Faith and practice maintained. Resistance must be established and advanced. NOTE: "A pope who attempts to destroy the Church is not to be obeyed but it is lawful to resist him by not doing what he orders and preventing his will from being executed.” Council Vatican I (1870) defined that a pope has no power or right to come out with new doctrines or to change the Faith which has been handed down from the Apostles but only to maintain and preach it. NOTE: A pope has the right to do nothing but to maintain the true Catholic Faith, exactly as it has been received. If he attempts to do otherwise, he is to be denounced and opposed along with all the doctrinal innovations he attempts to impose on the Faithful. We have seen that tradition instructs us that the global episcopate can fall away from the Faith and that true Catholics can be reduced to a handful. Popes can defect from the Faith and “teach” heresy in their decrees. They can destroy the Church with their acts. Then we must not obey but must openly resist the pope and the hierarchy and try to stop their policies from being implemented. Pope St. Peter I instructed us that we must obey God rather than men when there is a conflict between the two. The Doctors and theologians of the Church emphasized this by telling us “superiors are not to be obeyed in all things”; a “pope can err at times, and command things which must not be done”; and “we are not to be simply obedient to him in all things.” A pope can command “against Holy Scripture, or the articles of faith, or the truth of the Sacraments, or the commands of the natural or divine law”, and then “he ought not to be obeyed.” Further, St. Paul publicly resisted Pope St. Peter to his face because he was endangering the Faith. The Fathers and Doctors of the Church emphasized that we should “boldly” resist superiors, including the Pope, “without fear”, when we are defending the Faith; a pope who errs from the Faith must be resisted openly and publicly because of the danger which exists for the Faithful to be corrupted and led into error. And finally, we have seen that the Saints and approved theologians through the ages have told us that it can happen that “some new contagion attempts to poison, no longer a small part of the Church, but the whole Church at once”, and it can come to pass that “Catholics faithful to Tradition are reduced to a handful”. Should this happen the great concern of each “will be to attach himself to antiquity which can no longer be led astray by any lying novelty” – and it is the “Catholics faithful to tradition” who “are the ones who are the true Church of Jesus Christ.” Further, a pope can “destroy the Church through his evil actions” and then “it would be unlawful to allow him to act in such a fashion”; “on the contrary, there is a duty to oppose him”; there “would be a duty to prevent him, and likewise an obligation to oppose him and resist him”; “he may be resisted and the fulfillment of his commands prevented” with “open resistance”. Again, “it is lawful to oppose him publicly”; “every person, in fact, has the right to oppose an unjust action in order to prevent, if he is able, its being carried out.” Indeed, “it is imperative to resist a pope who is openly destroying the Church.” He “should not be obeyed” and it is “lawful to resist him” if he acts contrary to justice and the common good. A pope has no right to teach novelty. It is “lawful to resist him by not doing what he orders and preventing his will from being executed” should he destroy the Church. Question, do you know the source of the quote from Adrian II? Joe, your collection of statements speaks for itself and I thank you for bringing to the forefront where our loyalties are to be secured. LETS GO BACK TO THE BIBLE PERIOD. WHAT DOES THE BIBLE. LETS MAKE OUR CHURCH A BIBLE CHURCH THT WILL BASE ALL HER TEACHINGS AND REVELATIONS ON WHAT IS TAUGHT BY THE NEW TESTAMENT AND ALL THESE RUBBISH WILL CEASE, I AM A BIBLE BELIVE ROMAN CATHOLIC, THE POPE DOES NOT TELL ME WHAT TO BELIEVE AND WHAT TO DO. IF IT IS AGAINST THE TEACHINGS OF CHRIST I WILL NOT DO IT SIMPLE. BUT WHO MADE THIS MAN A POPE. IN THE PAT POPES SUFFERED MARTRYDOM, WALKED GREAT DISTANCES TO PREACH THE GOSPEL IN AN UNDILUTED FASHION. IN OUR OWN TIME POPES HAVE BECOME CELEBRITIES, TRYING TO PLEASE THE WORLD INSTEAD OF CHRIST WHICH IS SATANISM.THE QUESTION IS IS IT WHAT PETER DID. THE ANSWER IS NO. WHO GAVE POPE THE POWERS E WAS EXHIBITIG. IS IT IN THE BIBLE. THE ANSWER IS NO. 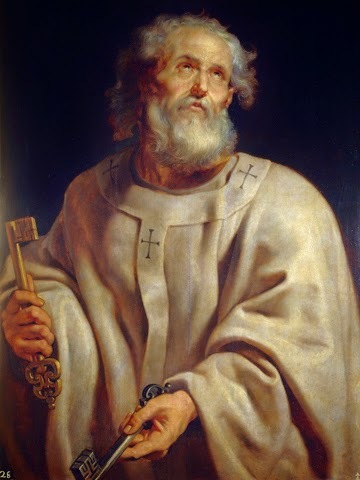 THE KEYS OF THE KIBGDOM OF HEAVEN GIVEN TO PETER IS A KEY THAT OPENS THE DOORS OF HEAVEN TO HUMANITY. THE KEYS ARE THE WORD OF GOD PREACHED BY OUR LORD JESUS, MEANRT TO BE GUARDED BY PETER AND THE APOSTLES ND PREACHED UNDILUTED. NOW THE FALSE POPE HAS MISINTERPRETED IT AND THOUGHT HE HAS POWERS TO CHANGE THE WORD OF GOD. THE MAN IS POSSESSED OF A LEGION OF DEMONS. TAKE IT OR YOU LEAVE IT. Madame, please do not type all in capital letters. In Internet etiquette, doing this is equal to shouting at the top of one's lungs. And it tends to get you ignored quickly, as well as give the impression of mental illness in what you say. I speak from experience over the years talking with folks on the Web who do this. Please fix this and thank you. Thank you, Wild Voice for all these Saints and Popes who address a question for which I have wanted some authoritative evidence to show others, for a long time. [I could only find the subject addressed once in the Catechism of the Catholic Church. And how good was our Pope to get this CCC out in the midst of such horrendous opposition.] This thorough article above well and truly drives it home in no uncertain terms. Indeed, it's a beautiful model for society in general and gives me courage to stand up to anyone in power or authority who is abusing that position. I do love what the Holy Spirit is achieving through this website. Some terrific resources for our so desperate times. Praised be Jesus Christ. The Pope Speaks — You Decide! WILD VOICE Who is your spiritual director? You are making people believe that Francis is not only the pope but allowed his position of power in the Vatican to be an antipope. JORGE BERGOGLIO IS NOT A MEMBER OF THE CATHOLIC CHURCH therefore cannot be head of which he is not even a member. You are not explicit in this major detail. Your claimed Catholic spirituality is convoluted. You cause people to become indifferent to the Apostolic Church. You make it appear that the Catholic Church is corrupt, that Jesus Christ is the source of corruption. Joe, here you have boldly speculated on what we may be 'making people believe', 'causing people to become' and 'making it appear that'. Your opinions and conclusions are welcome (within reason) even when they are this gravely and obviously erroneous. May God bless and guide you always. You submit claims to resist, however you've not proven it is a Catholic principle to recognize one to be pope and to resist him. The key, my friend, is obedience to Magisterial Teachings. Even protestants grasp the discrepancies of Francis. You and I are in agreement that he is a deceiver. A Magisterium that contradicts Magisterium is not Magisterium. Catholics unattached to the conciliar religion do not recognize him to be pope nor do they recognize Joseph Ratzinger who deviated from Magisterium before his election to have been a legitimate pope. Benedict XVI has never renounced his heresies and continually participates in the new sacraments promulgated in error by Paul VI. Who and or what is your authority? You might have meant to be on a different website all along. We say so because this page is not about Pope Benedict, but about the very FALSE PROPHET: the one and only False Prophet of whom it was written long ago. He has arrived and we must fight our battle against the risen Lucifer. To argue about the past is useless, for an army is stronger when united in Christ rather than divided by pride, opinions and/or past disagreements. May God Help us all, for soon this world shall change beyond recognition. Be strong, my friend, for all which we boast about will be reduced to dust. Then, and only then, we will know that the last trumpet is close to announcing the FINAL JUDGMENT. Let us be humble as we are made of dust. I've not made a mistake. I've read some of your other sites and you defend Benedict XVI to be pope. Benedict XVI is part of the cruel establishment that keeps Francis in power and take advantage of Catholic properties to perform their dastardly deeds. Neither men have loyalty to Apostolic Tradition, in fact they have explicitly renounced Catholicism in their writings, demonstrations and performances. We are hoping that what you have written may be just a temporary opinion, for we assure you that Pope Benedict XVI has never renounced Catholicism in any of his writings and/or in any other possible way. This allegation is completely unfounded, for we have never heard of any documents stating such fact. Neither have we seen Pope Benedict XVI "perform" anything which could possibly lead to such erroneous conclusion. There is only ONE FALSE PROPHET helping the Antichrist. There cannot be TWO FALSE PROPHETS at the same time as they could never be TWO POPES at the same time. And more importantly, those who have placed Jorge Mario Bergoglio in the papal office are also the ones responsible for the ousting of Pope Benedict XVI. But evil does not go against itself, for Christ Said so. Satan ousted the last true Pope and allowed the impostor to take his place. This is because these two people are diametrically opposed to each other. The truth is one as one is the Holy Catholic and Apostolic Church under one Jesus Christ. What you provided is irrelevant as based on personal opinion. Again, there are no documents proving that Pope Benedict XVI has renounced Catholicism all along. The only False Prophet bringing souls to the Antichrist remains "pope" Francis. Satan would have never ousted Pope Benedict XVI if he was doing his unholy will. To say the above is personal opinion is reckless on your part and also a sign of your desperation because you cannot prove and have not to date proven Joseph Ratzinger, antipope Benedict 16th fidelity to Catholic doctrine. How is that you excuse Joseph Ratzinger from his past performances of being a modernist? Do you have the courage to see a list of his anti-Catholic behaviors? Even the Vatican had him on record as a modernist. When did he renounce his errors? This is a very important question to prove your knowledge of Mr. Ratzinger who BTW also assisted at Assisi Meetings began by Karol Józef Wojtyła who was unjustifiably friendly with the communists. This page is about the False Prophet: "pope" Francis. We cannot list the nonexistent issues of a validly elected Pope of the Holy Catholic and Apostolic Church. By doing what you currently do (meaning to transfer the responsibility on our Holy Father, Pope Benedict XVI), your words come across as manipulative, my friend. Why focus on the past when Francis has just declared that Jesus Christ had to beg for forgiveness to His Mother? How can someone throw into the same box a virtuous doctor of the Church such as Pope Benedict XVI with an apostate (anti)pope whose destructive doctrine of darkness goes beyond the limits of any decent Christian's worst nightmare? If this is really what it is being done in this case, then you may choose to waste your time on useless demagogic tactics utilized for the purpose written above. If, instead, one is unable to distinguish between a follower of Christ and a follower of Satan, all I can advise is to ask God for discernment so as to know the difference between right and wrong. We had seen that clip. If you want, you can watch the video we made – which contains that same clip found on the link you have sent to us. Why won't you answer my questions? Do you fear studying the real life of Mr. Ratzinger? Thank you very much for this article. It's very timely and relative to what has been happening at this time. It's very enlightening and informative, and I strongly agree that we must oppose whatever misleading instructions and separate ourselves from the errors we have believed in – and that were taught to us all by our Mother Church. For generations, laws and decrees had been passed carefully abiding the instructions from our Lord Jesus Christ, and it's obviously spiritually wrong that some would attempt to alter it just to conform with what is socially comfortable and acceptable. Just in the issue of divorce in the Old Testament, Jesus said that Moses allowed it because of the hardheadedness of the people. I think this is also very true in our time. THIS ARTICLE SOMEHOW ANSWERS SOME OF MY QUESTIONS ABOUT THIS PAPACY. THANK YOU!